Adam Fuss’s body of work is notable not only for its continued concern with the themes of life, death and transcendence, but also for its utilisation of historical photographic methods such as photograms and, more recently, daguerreotypes. The three works in the Gallery’s collection from the series ‘My ghost’, eloquently represent many of the artist's concerns. The daguerreotype (a complicated form of 19th-century photography) is of a dead swan. The swan can be read as a mythical creature alluding to love and death, its wings poignantly bent in suspension, floating like an apparition. It is a further extension of the artist's preoccupation with incorporating the natural world in his work; earlier series (mainly photograms) have made use of rabbit entrails, smoke and spores. In this instance, the subtle beauty of the image, with the swan hovering in an opalescent sea of soft blue hues and milky whites, resonates with a spiritual quality. The use of the daguerreotype technique references the idea of a 'mirror with a memory' or, in a discursive sense, a presence through absence. The daguerreotype is a unique object, the result of a complex chemical process involving the exposure and fixing of the image on a silver-plated sheet of copper. Daguerreotypes of this size have always been rare. 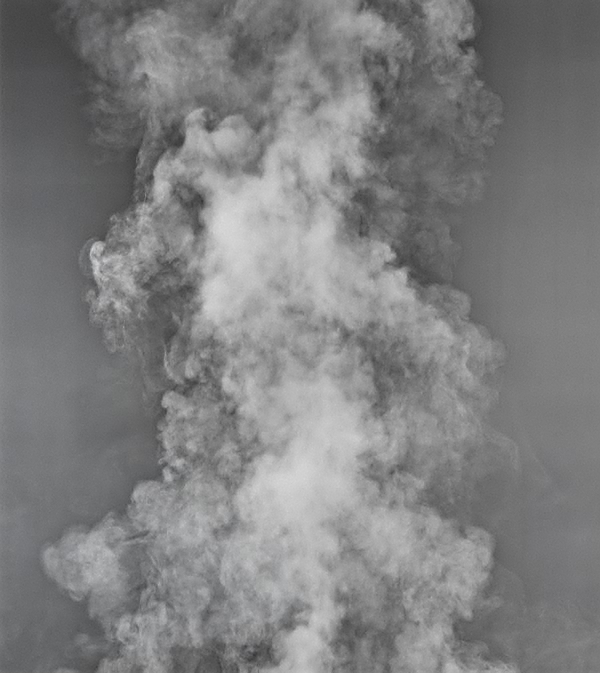 This unique photogram of smoke elaborates on the nature of evanescence. Although made through direct impression on photographic paper, the photographic technique (to fix light) is used here to illuminate intangibles and encourage meditation on the nature of life and its passing. Judy Annear, Photography: Art Gallery of New South Wales Collection , 'Magical realism', pg.226-245, Sydney, 2007, 243 (illus. ).